I was gonna post this in the Patreon/Middleman thread, but I think this is different enough that it warrants its own thread. I’ve personally not seen much of it, and it did seem like a pretty gross branding thing in general, although by the looks of the article some people quite enjoyed it. But like with most (all?) acts of “corporate benevolence”, eventually it stops being profitable and can just be evaporated (or in the case of MySpace, bumbled). So I think it brings up the question of when one works with a corporate entity, that the work, its identity, and longevity (not that this one matters too much) are subject to the whims of commerce. I don’t believe that one can “use” the corporation, or capitalism at large (as is kind of discussed in the Quitting Social Media thread), as simply operating in that space makes you a product (as well). Utilizing existing channels can wipe out a statement. There is a widely accepted misconception that media merely serve as neutral packages for the dissemination of raw facts. Photographers once thought that by getting their photographs published in Life, they would thereby reach large audiences. Gradually they discovered that the only message that came through was Life magazine itself and that their pictures had become but bits & pieces of that message. Unwittingly they contributed to a message far removed from the one they intended. I strongly agree with that idea, and have oriented my create work around a similar philosophical approach. Granted, that is a bit of a luxury in that I make my income as a teacher and don’t need to make money from art, but I do think it is an important idea either way. For example, in my current professional field (design) it’s almost expected that you write articles on Medium in order to get them in front of the community of practice. But when you publish on Medium it’s Medium and their system that gets the spotlight. (Ditto for twitter, facebook, youtube etc). As an artist it’s almost impossible to earn a living, or even just get your work in front of an audience, without engaging in some sort of commercial channel. Everything from Bandcamp, Soundcloud, Spotify, and YouTube to corporate entities like RBMA, larger labels, festivals, etc. All art that is for more than the artist entails compromise in some way. For each artist you have to choose what you are comfortable with and go in knowingly and critically… but who am I to judge? It’s hard to make a living, and if a platform like RBMA can do good for some artists while also promoting their brand, and the artists who are part of it are ok with that, then that’s cool for them and probably good for the field. RBMA is a bit of a positive case as far as I know, in that they offered lots of support and reach, but weren’t overly exploitative. If this thread started with some sort of overt exploitation by a corporation subsuming art or abusing artists we might be having a different conversation, and those things happen all the time. So in the larger sense, from my outside perspective, RBMA seemed like it was playing on the “right side” of what corporate arts engagement could look like, but wasn’t the norm. If anyone has experience to the contrary I’d love to hear it, I deffinitely don’t want to speak even middlingly about something that was actually bad behind the scenes. If RBMA hadn’t existed, hadn’t been able to disrupt the market in this way, it’s possible to imagine alternative platforms which might have achieved some of the same goals in more sustainable forms. Maybe without brands taking up that space, we’d see more room for existing decentralised models to grow: artists eschewing traditional PR-led approaches in favour of self-releasing, setting up their own labels and working more directly with the communities of listeners around them, instead of leaving entire scenes inescapably and overly reliant on a single source of funding. The way that’s written, it makes it sound like there aren’t alredy tens of thousands of musicians self-releasing. I know I’d enjoy having the support of a wealthy patron of the arts, within certain ethical limits and with clear boundaries set. That’s a thought. What is the message. Would putting my work out x way change the message? Wow, thank you for sharing this. Food for thought! Jayce Clayton (DJ Rupture) writes about his experiences with RBMA and corporate sponsorship in his book Uproot. Interesting take on local, organic scenes and distribution versus reaching for mass audiences and a paycheck. Bit of a spolier: Jayce went from deeply opposed to thoroughly conflicted about it. His telling of that journey is engaging, great read. Good discussion. 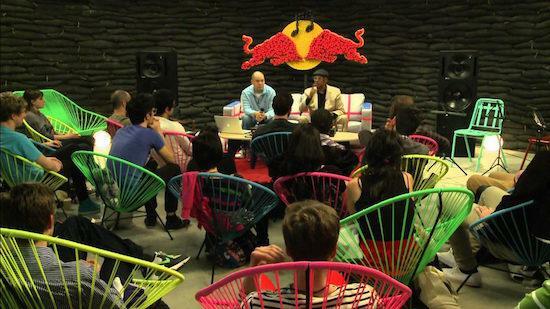 Figured I’d mention my experience with Red Bull Music Academy. I did some writing and editing for RBMA over the past few years. I wrote an essay (about Raster-Noton) for their hardcover For the Record book, and then to coincide with a big Tokyo event I edited four comics (featuring work by, among others, Conor Willumsen, Zack Soto, Gabe Soria, Haruhisa Nakata, Yuko Ichij, Dean Haspiel, Jordan Ferguson, and Hideki Egami). The RBMA folks I worked with were great collaborators, very supportive of the creative process, very deep into the music we were exploring, and had smart input throughout. We all make our choices, and learn from them, and make more choices, and learn from them. My experience with RBMA was a positive one. I don’t know how on brand this is with the greater discussion, but RBMA has made tons of really interesting videos with fairly high profile artists that I personally would not have had the privilege of reading/seeing/hearing. In Seattle, we got a chance to even have events where Theo Parrish would come and speak to amateur producers about not-so-basic topics in electronic music & production. If I were to take away something from the article is that now that these resources could potentially fade, I believe we should take steps to preserve that content if we are interested in preserving it. Maybe it’s shy of an obligation, but I think that those resources were worth sharing and passing around, so I’m sad to see them shutting down and would help with those efforts. Off topic so i’m sorry, but this reminded me of something else. Red bull helped skaters across europe to build their own (often technically illegal/guerilla) skateparks. They dropped branded bags of cement, aggregate and tools off at local skateshops and as far as i’m aware just let the skaters have at it. No expectation beyond that. It never made me drink red bull, but i’ve always thought that was really cool. I don’t recall where I heard this, but an there’s interesting POV on this is a conversation I had with a friend who has interacted extensively with RB and RBMA (we are both musicians and sometime show bookers/promoters who have brushed shoulders with the brand at various times). The thesis is basically that Red Bull, and a lot of companies like it, is essentially a lifestyle brand. Their primary “product” is cultural capital. The drink, as ubiquitously associated as it is with the brand, is really just the most consistent and profitable tool to keep the brand visible. In this way, it is in the direct interest of a company such as Red Bull to embed itself in many facets of popular, and even niche, culture. Their strategy, as I see it, is to financially support a vast and diversified array of creative pursuits from a local level to an international level, in return for an implied connection to RB through branding and “sponsorships”. The reason the death of RMBA is generally being perceived as a net negative is because of their savviness in what ways they capitalized upon [read: exploited] these grassroots structures—in many people’s experiences (including my own on several occasions) their support and programs were generous and undemanding of financial outcomes… they are making their money elsewhere, so the only thing that’s important to them in that context is brand visibility and association. I don’t, as a practice, mourn the maneuverings of giant companies. But it’s interesting to think about the things we can learn about the relationship between commerce and creativity and how these can be harnessed without totemic corporate interests. RBMA is super gross to me. “graduates” will praise them for the opportunity or whatever but to me its impossible to overlook the fact that the entire enterprise is just brand building/click driving for red bull, a multi-billion dollar energy drink magnate. this is what it started as and this is what it finished as, when they callously laid off a bunch of event/promo people in LA this past week. like- we all make our own distinctions about whats tenable, ethically and otherwise - for our creative work and i wouldnt deign to cast aspersions at people who “used the money of red bull to take the next step” or whatever, but to act as though its not sort of, fundamentally lame and not just essentially saying “yes my art is for sale for the use of your brand when its convenient or advantageous to you to make use of it” to a money-driven industrialist corporation is just delusional. Until very recent history (in the scale of history) most western art was supported by patrons, generally really wealthy people who wanted art for their houses or music for their concert halls and to look cool to their peers. (this might be true beyond western art, but I don’t have the knowledge to speak about it). Is that more or less gross that corporations essentially doing the same thing? Art has always had a precarious and complicated relationship to money/resources/support and where it comes from. but to act as though its not sort of, fundamentally lame and not just essentially saying “yes my art is for sale for the use of your brand when its convenient or advantageous to you to make use of it” to a money-driven industrialist corporation is just delusional. That’s all well and good… but are you suggesting that artists need to be independently wealthy, poor, or have to cram their art in around other jobs to be untainted or somehow legitimate? A good example is the “first novel,” The Tale of Genji, which was likely written in installments to be read by a lady-in-waiting to her lady and her lady’s friends. Whenever I get grand ideas about how art “should” be, I similarly like to ground myself in the knowledge that music for Haydn and Bach was as much a “day job”—done to please some entity with more power than they, be it church or state—as it is to any of the musicians a lot of us have called sellouts or worse in this thread. 1.red bull is the most agressive provider of soft drinks in clubs in europe, always trying to fukk you over coca cola-which is a very close number1 here. Horrible ppl trying to get horrible tings from clubowners=pure capitalism. 2.i had a very fun time teaching innercity youths to dj with a mobile rb truck/disco in public squares. No money involved just pure passion for whatever reason we did it, dj culture? I don’t want to be too cynical though: certainly something is lost in this endless cycling between birthing of subcultures and capitalism’s cooptation of them for profit. A just world would give each person space and support to pursue their creative desires without worry for their sustenance. The economics of what Red Bull did to support music and why is gross, to be sure. All I’m saying is that purity is too much to ask of musicians as people who need to eat. Partly because every time I have tried, I notice that all the people that come up as winners come from money or connections within the very thing I praise them for eschewing. •I never attended an RBMA anything. too expensive, in Queens, etc. the fact that I never liked Red Bull as a drink or a brand helped convince me to stay home. •Red Bull paid some artists more for their work then they will likely ever see again. I do not, and caution against, seeing the shuttering of a corporate festival as a “loss to the community.” A venue closing (DIY to small scale that you can book at) is a loss to the community. A record store, an affordable, well located cafe or gallery closing, is a loss to the community. Hey, get a commission! Get paid! It’s an increasingly rare privilege. But yo, RBMA didn’t have a check waiting for most of us. They had a weekend pass. Absolutely-weekendpass in our own community. I know several ppl providing content, being filmed and quoted for zero money. I must admit this isn’t something I’ve given a TON of thought yet, but I don’t totally see what the big problem was/is with RBMA. The value that our culture assigns to good music/art seems to be ever-decreasing- everyone expects to get music for free now, that sort of thing. So is it so bad that a large corporation was willing to put some funds towards giving these relatively obscure artists a platform to showcase their process and educate/inspire new young artists with said platform? Without getting too political, I consider myself pretty left-leaning and even I’m a little taken aback by this whole notion that anything a corporation ever does is evil just by nature of the fact that they are a corporation.